For years, Tim Donaghue had wanted to wrangle a car away from his grandparents’ storage shed to restore. The owner of TD Customs in Mills River finally got the chance two years ago, when his family in Caledonia, N.Y., told him he could work on a family heirloom. 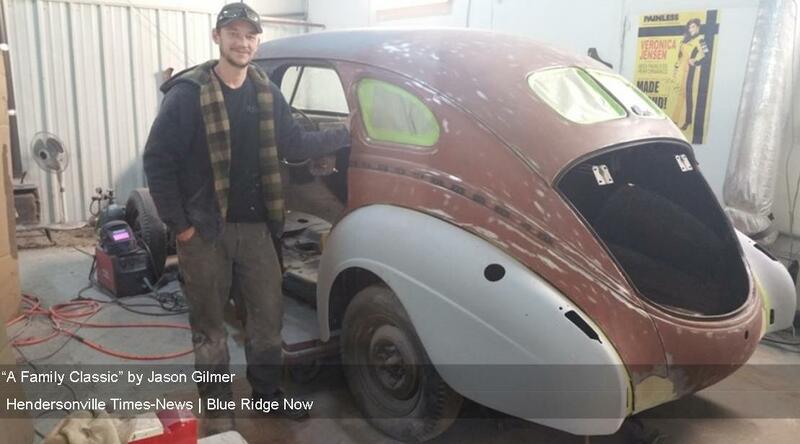 There was one car in particular he wanted to return to its former glory — his grandmother’s first car, a dark blue 1939 Chrysler Royal. It was the car his grandmother learned how to drive in. The restoration, started in 2015, became a major undertaking for Tim, his wife, Tara, and the others who’ve helped with the project. 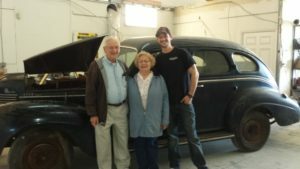 Tim Donaghue and his grandparents Allen & Pat Roggen in 2015 with the 1939 Chrysler Royal Donaghue is restoring as a gift to his grandmother. Now that it’s nearly done, Tim plans to return the car in August to its original owner in New York. “We want to get it finished and get it back up to her so she can drive it again,” he said. Tim’s grandparents, Pat and Allen Roggen, are in their 80s and, while his grandmother doesn’t drive too often, she does plan to drive her first car again once its returned. Long ago, Pat nicknamed the car “Ruthy” after the person she bought it from. Much work has been done to it since the antique Chrysler arrived in November 2015 at the Donaghues’ small shop, located a short distance off Boylston Highway. The last time the car was cranked was in 1956. 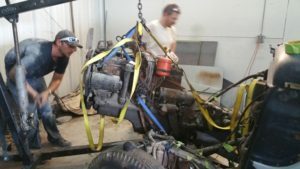 Tim, along with his crew of helpers, stripped it down to the metal in order to do the body and paint work and has replaced the engine and transmission. He’ll soon be finished with some wiring that will allow him to finally crank the car and bring it back to life. “Because I do this for a living I knew what to expect, but I think some of my family has been surprised by how much time and money it takes,” said Tim, who’s been working on the project after hours, on weekends and sometimes during his work day. 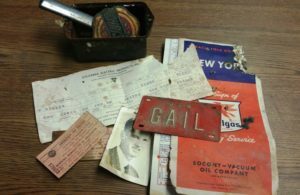 Contents of the glove box of Tim Donaghue’s grandmother’s 1939 Chrysler Royal amounted to a time capsule for the family. To get the car started he’s is having to replace the ignition, as the original keys had been lost over the years. The lack of keys forced him to pry open the glove box to see what was inside. When opened, what was stored there constituted a family time capsule. Tara noted that many restorations they do come with a story attached. “Either the car belonged to someone special or it’s a family project that everyone is excited to bring back to life,” said Tara, who has kept family members and others up to date on the project with blog entries on the TD Customs website. TD Customs owner Tim Donaghue observes as the engine of the 1939 Chrysler Royal is removed from the car’s stripped body. Because the car was stored in a building away from the elements, the Chrysler had little rust and only a few minor dents. Some spots needed steel patches, like a hole in trunk. Tim chipped the paint on the dashboard and repainted it so it has the look and texture of wood grain. Tim made a slight modification when he narrowed and hugged the bumpers closer to the body. He didn’t add power steering and power brakes like he wanted to because his grandfather wanted to keep the car as it was originally manufactured. TD Customs is not the only family business working on the restoration project — Barbara Jean’s Custom Upholstery in Castile, N.Y., owned by Tim’s aunt, has been working on the car’s interior. Once Tim returns the car to New York, the interior will be reunited with the body. 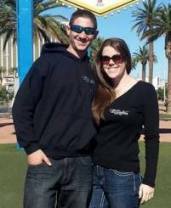 Recently, the couple received a note from Tim’s grandmother. To learn more and see additional photos, visit tdcustoms.com. No Replies to "'A Family Classic' ~ TD Customs featured in Hendersonville Times-News"